In Rochecotte, old residence of Prince of Talleyrand, the life is beautiful to live and to spend. Here, the antic pediment for the setting in scene. There, the italian terrace to dominate the Loire. Elsewhere pure Interiors and gardens "à la Francaise" for softness or the daydream. Faithful to a prestigious and greedy past, the table of Rochecotte abounds in elegant savours. 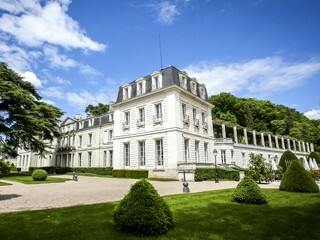 And the whole castle - living rooms, suites and rooms, park and superb surroundings (Bourgueil-Chinon's veynards) - is full of ideas of exceptional stays !